Thai Airways is implementing a new commercial strategy which focusses more on transit traffic and seeks to boost load factors and yield. Thai is particularly targetting the kangaroo route between Australia and Europe, seeing an opportunity to regain market share as other Asian airlines reduce their focus on Australia. Thai Airways is also planning to pursue regional growth within Asia as its full service short haul subsidiary Thai Smile expands its international operation and improves aircraft utilisation. Thai Smile will play an important role in boosting network connectivity for the group's long haul to short haul connecting traffic such as Australia or Europe to Asia along with more intercontinental connecting traffic in markets like Australia-Europe. This is Part 2 in a two-part series of analysis reports on Thai Airways. The first part focussed on changes to Thai's fleet plan, in particular its decision to delay 747-400 retirements, and upcoming capacity increase to Europe. Thai is adjusting schedules over the next few months to improve connectivity. In parallel it has embarked on marketing initiatives to push sales of certain city pairs where it sees an opportunity for higher market share. In many cases Thai has seen passenger traffic slip in key one-stop markets due to a lack of focus. Intensifying competition also has obviously had an impact. With the right commercial focus Thai is confident it can grow transit traffic in both the economy and premium cabins. This in turn will help the group with its goal of boosting load factors and yields. Yields are usually compromised when the portion of transit traffic increases. But Thai is implementing new revenue management initiatives and has a local market which has typically seen very low yields as it consists primarily of price sensitive leisure passengers. Thai particularly sees an opportunity to boost its share of traffic to and from Australia. While several other Southeast Asian airlines have reduced capacity to Australia over the last year, Thai has maintained its Australian capacity even as it has restructured its network elsewhere. Thai currently operates 38 weekly flights to Australia including 14 to Melbourne, 10 to Sydney, seven to Brisbane and seven to Perth. Over the last year total seat capacity between Australia and Southeast Asia has been reduced by about 10%. Malaysia Airlines (MAS) has made the largest cut but Garuda Indonesia and AirAsia X have also made significant reductions. Capacity at market leader Singapore Airlines has been roughly flat. Thai now has more capacity to Australia than MAS and has widened the gap with Garuda. Thai also has about as much capacity to Australia as AirAsia X while SIA is about three times larger. Thai is now the fourth largest airline in the Southeast Asia-Australia market, having recently surpassed MAS and Malaysian long-haul low-cost carrier AirAsia X. As CAPA previously highlighted, MAS cut capacity to Australia by about 40% in Aug-2015 and has suspended Brisbane. Thai and Singapore Airlines are now the only Southeast Airlines serving Brisbane, which was also served by Garuda until early 2015. Other Asia airlines are now reducing focus on Australia-Europe, concluding that it is nearly impossible to compete with the Gulf carriers. For example, Malaysia Airlines CEO Christoph Mueller recently told Fairfax media that the Australia-Europe market is now “firmly in the hands of Middle East carriers” and the “market is gone” for Southeast Asia’s flag carriers. But Thai’s new management team still sees opportunities in the Australia-Europe market. While Australia’s outbound market has been impacted by the depreciation of the Australian dollar overall international traffic to and from Australia continues to grow. Over the last three years, total passenger traffic between Australia/New Zealand and Europe has increased by approximately 50%, according to data from OAG Traffic Analyser. Thai carried only about 3% of total passengers in the Australia/New Zealand-Europe market in the 12 months ending Jul-2015, according to OAG Traffic Analyser. It was the ninth largest airline in this market over the specified timeframe, behind Emirates (about 27%), Singapore Airlines (15%), Etihad (11%), Qantas (9%), Qatar Airways (7%), Cathay Pacific (6%), MAS (5%) and British Airways (4%). In Australia and Europe Thai has traditionally focused more on local inbound traffic to Thailand. It has always received some transit passengers but often these have been passengers seeking a stopover in Thailand in one direction. Thai believes by improving network connectivity it can attract more pure transit traffic. Thai needs more transit traffic to reduce its reliance on the local market and boost yields, particularly if it succeeds at attracting more premium transit traffic in markets such as Australia-Europe. Thai believes it has been undercharging for its business class product, particularly as it offers a lie-flat business class seat across its fleet of A380s, 777-300ERs and 787-8s. The 747-400 fleet does not have a lie-flat business class seat but has been retrofitted in recent years and has a first class cabin with flat-bed seats. Australia-Europe is just one of several markets Thai is now targetting as it seeks to boost transit traffic numbers as well as load factor and yields. Thai also sees opportunities to increase connecting traffic from Australia and Europe to regional destinations in Asia. Regional connections, particularly to secondary cities, are generally higher yielding and do not face competition from Gulf carriers, which typically only serve the main destinations. But competition in the regional connecting markets has also been intensifying as MAS and SIA have been increasing their focus on such markets. Southeast Asian LCC groups are also starting to aggressively pursue more transit traffic between Australia and Asia. Thai has been growing its regional operation and sees further opportunities for growth within Asia, driven in part by feed from long-haul routes. Regional RPKs were up 27% in the first eight months of 2015. Regional ASKs were up 11% and load factor improved 9.6ppts to 76.1%. Although it has been reducing the size of its fleet (as outlined in the first report in this series) Thai Airways has been able to maintain capacity through the first three quarters of 2015 by improving aircraft utilisation. Through the first eight months of 2015 total ASKs were up 0.3% compared to the same period in 2014. RPKs were up 8.4% as the group has been able to improve its average load factor through the first eight months of 2015 by 5.5ppts from 68.4% to 73.9%. Passenger numbers were up 7.8% to 12.6 million. The improvement comes on a very low base as Thai had an average load factor of only 69% in 2014. Thai is confident its load factor can further improve as the new commercial strategy is implemented and potentially reach 80% in 2016. 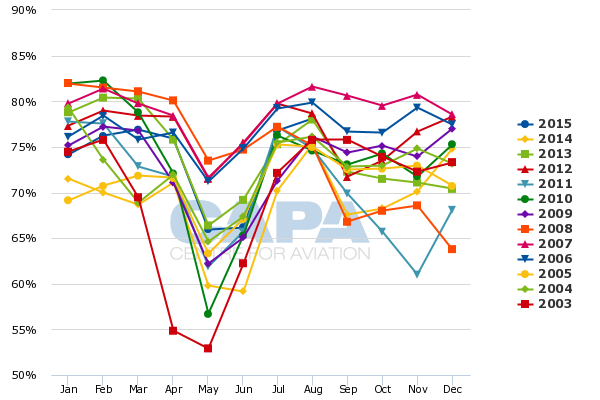 Thai’s average load factor has typically averaged the mid to high 70s with a high degree of variation month to month depending on the time of year. Traffic was impacted in Sep-2015 by the 17-Aug-2015 bombings in Bangkok but Thai Airways CEO Charamporn Jotikasthira told CAPA recently that the typically resilient Thai market has been recovering rapidly. Some markets, primarily regional routes, experienced a 15% reduction in Sep-2015 and are expected to see about a 7% reduction in Oct-2015. But these markets are expected to be back to normal by Nov-2015. Thai is therefore confident it can achieve its load factor targets for the end of year peak season and for 2016. Modest capacity increases are likely in 2016 as Thai continues to work on improving aircraft utilisation rates. Thai mainline has already increased average increase utilisation rates to about 11 hours per day but Thai Smile is currently only using its A320 fleet an average of about eight hours per day. Thai believes it can still squeeze more utilisation out of its mainline fleet but particularly sees opportunities to significantly improve the utilisation of its A320 fleet. This will be achieved as Thai Smile adds new medium-haul international routes, which will be operated during overnight hours, driving a higher utilisation rate and an increase in regional capacity. Thai Smile currently only operates domestically with the exception of one international route, Bangkok-Macau. Plans for taking over several international routes from Thai Airways mainline have been repeatedly delayed by regulatory hurdles. As CAPA reported in Mar-2015, Thai Airways has been temporarily operating five A320s which were initially intended for Thai Smile. Thai Smile had been planning to take over these A320s and start operating several international routes by the beginning of the northern winter schedule in late Oct-2015. But the group has had to again delay shifting A320s back to Thai Smile as it has taken longer to secure the required approvals from some of the countries Thai Smile plans to serve. The regulatory delays are related to ICAO's early-2015 finding against the Thai DCA, which has prompted several countries to halt or delay the approval of new flights from Thai carriers. Thai Airways has been operating in most of these markets for several years but as Thai Smile only received its own air operators' certificate (AOC) in 2014 it is therefore considered a new carrier. The group is confident Thai Smile will gradually secure the required approvals over the next several months. Shifting all the A320s to Thai Smile is also an important driver to Thai’s overall transformation as it will help reduce costs. Mr Charamporn said the A320 operation at Thai Airways is significantly more costly than the A320 operation at Thai Smile. Thai has been required to train its own crews for the A320 while Thai Smile uses separate less expensive crews to operate the aircraft under its AOC. While Thai Smile is not considered an LCC it provides a lower cost base for Thai Airways, enabling the group to expand its presence in the regional international market. SilkAir has a similar role under SIA as SilkAir is lower cost and been expanding rapidly while SIA mainline has maintained roughly flat capacity. In addition to taking over and launching several new international routes, Thai Smile may also eventually take over all domestic operations. But at least for the short to medium term Thai Airways will continue to operate widebodies on three trunk routes – Bangkok to Chiang Mai, Krabi and Phuket – and 737-400s to Samui. But Mr Charamporn believes operating widebody aircraft with large premium cabins on domestic routes is not ideal and expects this will need to be resolved over the long-term. Eventually more A320s will likely be required, particularly if Thai Smile takes over all domestic flying. The group currently has 18 A320s (including the aircraft temporarily operated under the Thai Airways AOC) and has commitments for only two additional A320s, which will be delivered in 4Q2015. But narrowbody aircraft acquisitions are not currently being considered – as is the case with widebody acquisitions. The group for now is focussing on increasing Thai Smile capacity by improving utilisation. The group will also likely free up three A320s for feeder routes by suspending Thai Smile's operation at Bangkok alternative airport Don Mueang. Thai Smile has been operating three point to point domestic routes from Don Mueang since 2H2014. The rest of the Thai Smile operation is based at Bangkok Suvarnabhumi, where Thai Airways has its hub. The Don Mueang operation has never made sense strategically. As CAPA wrote in Mar-2015: "Ultimately the Don Mueang operation could prove to be a distraction. Focusing on one role and one hub would be logical. Thai Smile has relatively limited resources that could be better put to use on feeder routes at Suvarnabhumi, particularly as its parent restructures." Mr Charmporn acknowledges the Don Mueang operation could be suspended if there is a need for more A320s for feeder routes from Suvarnabhumi. Ending the Don Mueang operation could also be an outcome of increased cooperation with Thai Airways Group low-cost affiliate Nok Air. Nok currently operates all three of the Don Mueang routes offered by Thai Smile and has the largest domestic network in Thailand. Nok currently serves several domestic destinations that are not part of the Thai Airways or Thai Smile network. But Mr Charmporn said connections would be hard to pursue given Nok will continue to operate from Don Mueang. Nok currently has a leading 37% share of domestic seat capacity at Don Mueang compared while Thai Smile has just a 5% share. 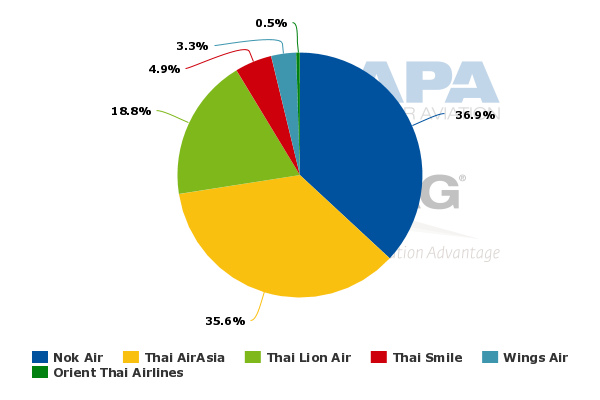 Thai AirAsia has about a 36% share while Thai Lion Air has about a 22% share. The AirAsia Group has by far the largest international operation at Don Mueang, accounting for over 70% of international seat capacity. Nok currently operates only two international routes. Sister long-haul low-cost carrier NokScoot also operates one (soon two) international routes but does not have any cooperation with Thai Airways. At Suvarnabhumi, Thai Airways and Thai Smile combined account for a leading 39% share of total seat capacity. 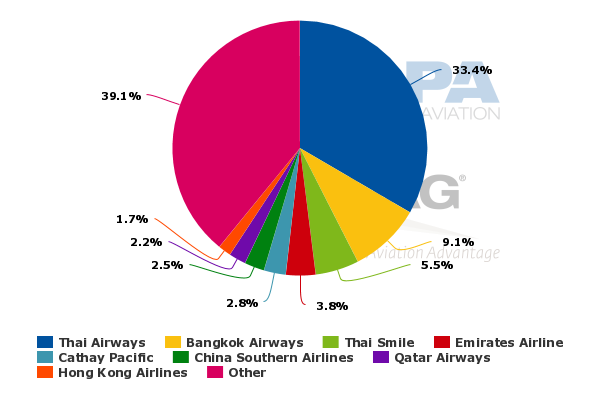 This includes a 63% share of domestic capacity at Suvarnabhumi (Bangkok Airways is the only domestic competitor at Suvarnabhumi) and a 34% share of international seat capacity. Over 80% of seat capacity at Suvarnabhumi is international, while over 70% of seat capacity at Don Mueang is domestic. Over the last few years Thailand’s LCC sector has undergone very rapid growth while Thai Airways' traffic has declined. As CAPA previously highlighted, Thailand’s LCC fleet is expected to reach 100 aircraft by the end of 2015, compared to a fleet only 74 aircraft at the beginning of 2015 and 54 aircraft at the beginning of 2014. At Don Mueang, LCC passenger traffic increased by 32% in 2014 and 44% in 1H2015. But Mr Charmporn sees the surge in LCC traffic as good for Thai as the LCCs are creating a new market. He believes over time some of the Thais who are now flying for the first time will also fly on full service carriers, particularly as their income levels continue to increase and they travel overseas. LCCs now account for almost 70% of passenger traffic in Thailand's domestic market and have about a 25% share of the international market. While there are opportunities to work with LCCs Thai is committed to remaining a premium carrier. Thailand has always had a smaller share of premium traffic than other Asian airlines but Thai sees an opportunity to improve its premium yields by focussing more on premium transit traffic. Thai still faces huge challenges as it tries to complete its transformation. Competition continues to intensify in Thailand with ambitious expansion from LCCs and Gulf carriers. As Thai focusses more on transit traffic it will also face increased competition across one-stop markets. Load factor improvements should be achievable, particularly if market conditions in Thailand continue to improve. But whether Thai will be able to improve load factors without further sacrificing yields is questionable. Thai however should be able to continue to making progress in cutting costs. The airline group has already become significantly more efficient and should see more efficiency gains as it better uses its assets and reduces headcount. The group’s operating profit narrowed by 97% in 1H2015 to only THB297 million (USD9 million), giving Thai confidence it could return to profitability in 2016. But fundamental to a successful restructuring will be Thai's need to prove its new commercial strategy in boosting load factors and yields against an extremely challenging marketplace.